Considered a delicacy by the Romans, these tiny, delicate seeds pack a harsh and penetrating punch. 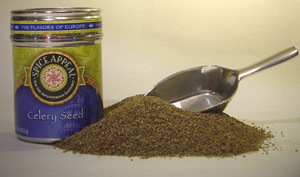 Also called Lovage, celery seeds have a strong flavor and should therefore be used sparingly. Their herbal, citrus aroma livens up tomato juices, chicken soups, pickles, salad dressings, coleslaw, breads and meat.